The Judeo-Christian Bible tells a wonderful story. It is, in fact, often referred to as “The Greatest Story Ever Told”. Let’s closely examine the original, conceptual foundations of the faith, and then decide “…if Christ be not risen. ” But in order to do that, we must go back, not 2.000 years to the birth of Christ, but 8 to 10,000 years to the birth of modern man. For when one seeks to establish foundations, one must begin at the beginning. Many thousands of years ago in what we refer to as the the “primordial world” of the ancients, human life was a far different experience to that which we enjoy today. While it is true that we have less documentation on that prehistoric world than we have on our own age, ample enough is known from the ancient writings to paint a rather clear picture of our primitive ancestry. If we have learned anything at all, it is this: The more we change, the more we stav the same. And nowhere is this more clearly demonstrated than in the history of man’s quest for “God”, and the ancient religion we still keep holy today. According to the best understanding we have gleaned from the available records, life for our ancient forefathers was a mixture of wonder and fear. Each day, just finding food for one’s family without becoming a meal yourself for the roaming predatory animals, was a life and death struggle. (If you have ever ventured out on a cold night with insufficient clothing, and without friend or family near, you could quickly see how fearful the dark, cold primordial nights could be) And then came winter! – “Astro-Theology” or, “The Worship of the Heavens”. This is the first, original, and therefore the oldest, and most respected story on Earth! It did not take ancient man very long to decide that in this world the single greatest enemy to be feared was the darkness of night, and all the unknown dangers that came with it. Simply stated, man’s first enemy was darkness. With this simple truth understood, we can now begin to unravel an ancient and wonderful story. Today, as in all mankinds’ history, it has once again been told anew. Modern-day Christianity has often belittled our ancient ancestors who are not here to defend themselves. They falsely accuse that they were nothing more than ignorant worshippers of the sun. Therefore we can, with assurance, summarily dismiss thousands of years of human spirituality as ignominious myth, believed by well-meaning, but gullible primitives. Too much of this kind of spiritual arrogance and religious pride has continued without challenge. The time has come to set matters straight. First. no people of the ancient world believed the “Sun” to be “God”. That belongs in the “disinformation file”. First, with the exception of Japan, the ancient world mythologies always understood the Sun to be masculine in qualities, and the moon feminine. Second, the English language is derived from the German. In the Germanic, the word ‘Sun‘ is spelled ‘Sonne’. The two words can (and have been) used interchangeably. The Statue of Liberty…to this day, kings still wear a round “crown of thorns,” symbolising the rays of the Sun! The “Ancient Story” went something like this…. 2. As stated before, in the dark cold of night man realised his utter vulnerability to the elements. Each night, mankind was forced to wait for the ” Risen Sun” to chase away the physical and mental insecurity brought on by the darkness. Therefore, the morning Sun focused man’s attention on heavenly dependents for his frail, short existence on Earth, and in doing so, it became the appropriate symbol of divine benevolence from heaven. 3. So just as small fire brought limited light into man’s own little world of darkness, likewise the “Great Fire of Day” served the whole Earth with its heavenly presence. For this reason, it was said at Deut 4:24, and Heb 12:29 that the God of the Bible was a “Consuming Fire” in heaven. And so He is! 4. It was accepted by all that man was bound to a life on Earth, but the sky was God the Father’s abode – His dwelling place. Naturally, God’s Son/Sun would also reside with his Father ” up in HEAVEN”. 5. Ancient man saw in his male offspring his own image and likeness, and his own existence as a father was proved by the person of his son. It was assumed that God’s ‘Sun was but a visible representative of the unseen Creator in heaven. So it was said, “When you have seen the Sun, you have seen the Father “. or “The Father is glorified in his Sun”. 6. Ancient man had no problem understanding that all life on Earth depended directly on life-giving energy from the Sun. Consequently, all life was lost without the Sun. It followed that God’s ‘Sun’ was nothing less than “Our very Saviour”. If you don’t think so, wait ’till it don’t come up! 7. Since life is energy, and energy from the Sun gave life, and we sustained our very existence by taking energy in from our food (which came directly from God’s Sun), the Sun must give up its life supporting energy so that we may continue to live. 8. While it was plainly true that our life came from and was sustained each day by “Our Saviour… God’s Sun”, it was and would be true only as long as the Sun would return each morning. Our hope of salvation would be secure only in a “RISEN saviour”. For if he did not rise from his grave of darkness,all would be lost. All the world waited patiently for His ‘imminent return”. The Divine Father would never leave us at the mercy of this world of darkness. His Heavenly promise concerning his Sun was surely that…”He would come again“…to light our path, and save those lost in the darkness … and He still does…every morning about 5:30 am. 9. Logically, even if man himself died, as long as the Sun comes up each day, life on Earth will continue forever. Therefore, it was said in the ancient texts that everlasting life was “the gift” that the Father gives through his Sun. For…”God so loved the world that he gave his only begotten SUN that we may have life everlasting”….on Earth! Not for you personally – but ON EARTH… everlasting life! 11. With the return of the Sun each morning, man felt more secure in his world and therefore, was at peace. Therefore, God’s ‘Sun’ was with his warm rays of life and hope…The Great “Prince of Peace“. 12. And of course the reverse was equally true. The dark evil of night was ruled by none other than…”Prince of Darkness“… The EVIL / DEVIL. “I AM THE LIGHT OF THE WORLD, and no man comes to the Father except through me”, or one comes to God Only by the Light of Truth. 16. We should all “give thanks” to the Father for sending us His “Sun”. For the peace and tranquillity he brings to our life is even called ‘Solace’ – from “Solar” = Sun. 18. It is at this point that we come to Egypt. More than 3,000 years before Christianity began, the early morning “Sun/ Saviour” was pictured in Egypt as the “New Born Babe”. The infant saviour’s name was “HORUS”. 19. The early morning Sun or “New Born Babe”, was pictured in two ways. (who punishes the enemies of God!). 20. At daybreak. this wonderful, newborn child, God’s ‘Sun’, is … ‘Born Again’ Horus is Risen. Even today, when the Sun comes up, we see it on the “Horus-Risen”, or “Horizon”. His life was also divided into 12 parts or steps across Heaven each day: 12 HORUS = 12 HOURS. This is the origin of the modern ” 12 Step Program”. Horus is the (new-born) Sun, or the Bringer of the Light. In Latin, Light Bringer is Lucis, or Lucifer, or Luke. 21. But now, what about the evil brother of God’s Sun, that old rascally “Prince of Darkness” himself? In the Egyptian, he was called “SET”. We are told in the Bible that when God’s Sun died, He left the world in the hands of the Evil Prince of Darkness. This evil prince took over the world at “SON-SET“. 22. It was generally observed that ‘God’s Sun’ could be depended upon to return in the same manner that he left, namely, “On a Cloud““..and that “Every eye will see Him“” … Every evening, go out and watch the Sun leave this world “on a cloud”. And next morning, watch to see Him return on a cloud. And every eye will see him come again! … Unless you’re blind! 23. Keep in mind ‘God’s Sun’ symbolically represented the light of truth, but was condemned by His enemies who could not endure the light of truth in their life. The ancients taught that the very act of opposing or denying the light of truth to the point of killing it, happened in one’s own mind! When we are confronted with the harsh realities of life, the light of truth, which we do not wish to face, and which runs counter to our views, such truth is judged in your mind, or judged “in the temple area” of your brain, and put to death in your head ! Therefore, ‘God’s Sun – The Truth and The Light – is put to death at “GOLGOTHA” , or “PLACE OF THE SKULL “, located somewhere between your ears! This putting to death of the light of truth in your mind is always accompanied by two thieves: Regret for the past and Fear of the future. 24. And of course God’s ‘Sun’ goes to His death wearing a “corona” – Latin for “Crown of Thorns” . Remember the Statue of Liberty? To this day, Kings still wear a round crown of thorns, symbolising the rays of the Sun! 25. God’s ‘Sun’ brought His wonderful light to the world, and distributed it over 12 months. So it was said, God’s ‘Sun’ had 12 companions, or helpers, that assisted His life-saving work. So it was, God’s ‘Sun’ had 12 apostles (or months) that followed Him religiously through His life. Incidentally, now you know why the American jury system has 12 jurors who help bring the truth to light, with the “Light of Truth”. 26. As far back as we can go into the ancient world, we find that all known cultures had a “Three-in-one” Triune God. The very first trinity was simply the three stages of the life of the Sun. The Trinity is truly a mystery…Like electricity, radio, TV, and jumbo-jets are all a mystery to the un-enlightened mind! 27. The Egyptians knew that the Sun was at its highest point in the sky (at high noon). At that point, one offered prayers to the “Most High” God! To the ancients, the sky was the abode, or heavenly temple, of the “Most High”. Therefore, God’s ‘Sun’ was doing His heavenly Father’s work of enlightening all in the temple at 12 …not 12 years old, but 12 noon! 29. Since the Earth experienced 4 different seasons, all the same and equal (in time) each year, the round Sun calendar was divided into 4 equal parts. This is also why we have, in the Bible, only 4 Gospels. Of this point, there can be no doubt. The 4 Gospels represent the four 4 seasons which collectively tell the entire story of the life of God’s ‘Sun’. Matthew, Mark, Luke, John are Spring, Summer, Autumn and Winter. 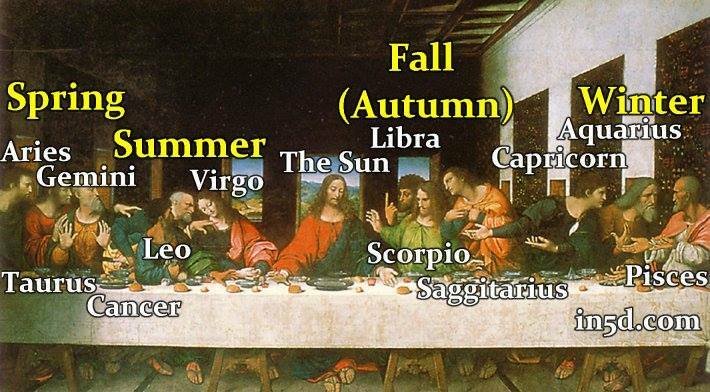 This is why the famous painting of “The Last Supper” pictures the 12 followers of the Sun in four groups (of three) … the seasons! 30. On the round surface of the yearly calendar, you can draw a straight line directly across the middle, cutting the circle in half… one end being the point of the winter solstice; the other end being the point of the summer solstice. Then you can draw another straight line (crossing the first one); one end of the new line being the spring equinox; the other end being the autumn equinox. You now have the starting points for each of the 4 seasons. This is referred to by all major encyclopedias and reference works, both ancient and modern, as “The Cross of the Zodiac”. Thus, the life of God’s ‘Sun’ is on “the Cross”. This is why we see the round circle of the Sun on the crosses of Christian churches. The next time you pass a Christian church, look for the circle (God’s Sun) on the cross. The Sun, since the first day of summer, has each day been moving southward, and stops when it reaches its lowest point in the Northern Hemispheric sky (December 22nd – our winter solstice). This is the only time in the year that the Sun actually stops its movement Northward or Southward in our sky. On the morning of December 25th the Sun moves one degree northward beginning its annual journey back to us in the Northern Hemisphere, ultimately bringing our spring. Anything steadily moving all year long that suddenly stops moving for three days was considered to have died. Therefore, God’s Sun who was dead for three days, moves one-degree Northward on December 25th beginning its annual journey back to the Northern Hemisphere. The Sun is symbolically ….BORN AGAIN. And to this day, His worshipers still celebrate His BIRTHDAY!…. Merry Christmas. 31. Today we use expressions when someone dies. We say things like, “They Passed“, or “They Passed On”, or “They Passed Away”. The ancients said “They Passed Over” (from one life to another), And so it was with the coming of spring, as God’s Sun is “Resurrected” from the Death of Winter to His New Life (in spring). In the ancient world, long before the Hebrews ever existed, the celebration of spring was called “The Pass Over.” The Sun, which was dead in winter, has passed over to His new life in spring. This is the origin of the modern Pass Over celebration.